Here is a spoiler of sorts for the May 2015 Popsugar Must Have box. Since I failed so miserably at my last guess, I'm no longer guessing! Pfft. BUT it looks like this May Box promises to add some sunshine to our lives. Quite frankly, I need it. I'm tired of rain and gray skies. I cannot believe the April box is sold out already! 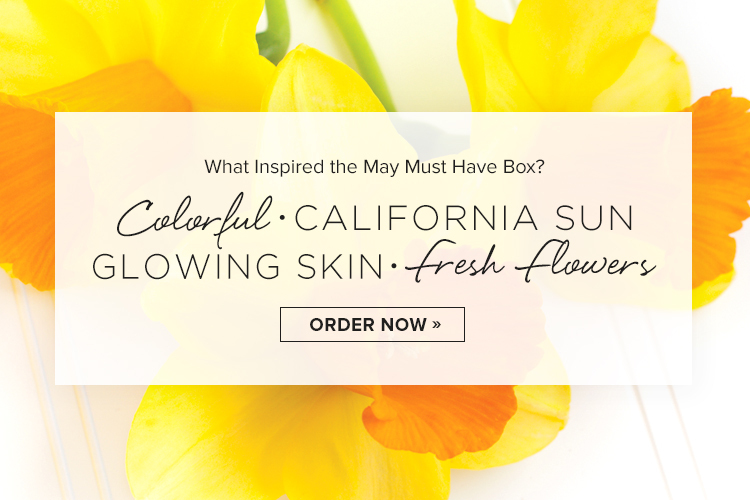 If you want the May Must Have box, I'm encouraging you right now to snap it up. They must really have cut back on the number of boxes they are offering. It used to be that you could wait and see what everyone else got before deciding to take the plunge. That is no longer the case! I love everything about this spoiler except for the "glowing skin" part because if that means a sunless tanner, I'm going to be bummed. Those things never work out for me because I'm such a ghost in the first place. Although, I think around here (Seattle) no one is offended by ghostliness because unless you frequent a tanning booth or have naturally dark skin, paleness is just the way it is. Sign up here to get the May box and make sure to use REFER5 to get $5 off your first box. What do you think about this new way of doing things? Are you excited by the teaser? Please please no self tanner! Anything but that, I embrace my Casperness! Why fight it in Western Washibgton? !